Recorded on Dec. 19, 1958, this song was written by Bertholt Brecht for his famous “Threepenny Opera” (little known fact: it was originally written in German) 30 years earlier, and Louis Armstrong had already given a bit of new life to the song with a hit of it in 1956. But no matter who came before or later (Dean Martin did a live performance of it in ’59), Darin clearly owns the song with this definitive version, which remains an all-time classic to this day. 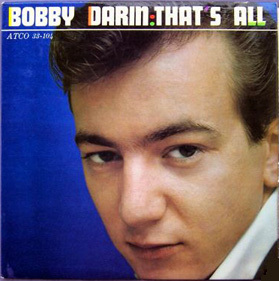 That same recording date, Darin also cut “That’s the Way Love Is,” which is also a fine record, and one that does an excellent job of nailing the feeling one feels when a guy has that one special woman in his life and how strangely all that works. In between this aforementioned span of time, he also cut two other dynamite records, both being strong, jazzy versions of the standards “Softly, As In A Morning Sunrise,” and “I’ll Remember April,” which are great for getting you up in the morning. But the session was capped off with another definite pop record of the 1950s, and of Darin ‘s career: “Beyond the Sea.” The song was first recorded as “La Mer” by Charles Trenet in 1946, but Darin sang it to the English lyrics we all know and love today. If ever somebody dear to you has been situated overseas, this song is the ultimate morale-booster, and it was recorded on Christmas Eve of 1958, 55 years ago today. Oh, and the title cut was, ironically, the last track on this album: it’s arrangement is, er, rather unique compared to the more traditional arrangements of this particular standard.